For the last 40 years, Alameda’s Jeff Raz has performed nationally and internationally with circuses and theaters including Cirque du Soleil, The Pickle Family Circus, Lincoln Center Theater, Berkeley Repertory Theatre, Marin and SF Shakespeare festivals, TheatreWorks, Marin Theater Company, and more. Besides also having written 15 plays and directed multiple musical, theatrical, and circus performances, he also founded the Clown Conservatory in the Bay Area as well as the Medical Clown Project. 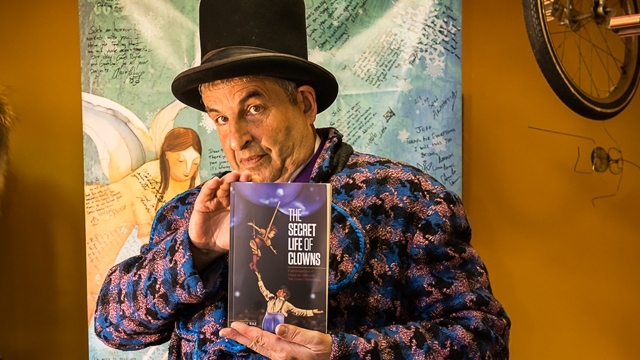 His first book, The Secret Life of Clowns: A Backstage Tour of Cirque du Soleil and the Clown Conservatory, is out now. What drew you to becoming a clown? When I realized I could juggle, I became interested in pursuing my talent and taking it to the next level. In 1974, I saw the San Francisco Mime Troupe production of The Dragon Lady’s Revenge in Berkeley, and I knew then what I wanted to do. I started performing professionally at the age of 15, working as a juggler at Renaissance fairs, circuses, and on the streets. In an acrobatics class, I met the folks from Everybody’s Family Circus, a small local circus, and they hired me to work as a clown/juggler. I do believe I was at the right place at the right time and feel lucky to have found my calling at a young age. I really didn’t consider other options. I had something wonderful to pour my teenage energy into, and it sure took a lot of energy. I would say that being a street performer in Berkeley in the ’70s was as good as it gets. Do you still perform and/or teach? Yes, I am still very involved in many capacities of performing and teaching, though I now consider myself a senior member of the artistic community in the Bay Area. Some of my jobs include being a Bay Area casting partner for Cirque du Soleil, president of the board for the Medical Clowning project, and a communications consultant for Stand & Deliver, a global communication and leadership consulting and training firm based in California. I also just finished co-directing 45 kids in the musical Carnival in San Francisco and am in the beginning stages of starting a dance piece about Marc Chagall for Joanna Haigood’s Zaccho Dance. My most current focus is getting the word out about my recently published book. Would you say that clowns are a dying breed or are they still going strong? I would say that while there has definitely been a big shift in the circus world, clowning is very much going strong and in many different areas of life. The Medical Clown Project in the Bay Area that my wife and I founded is just one example of the valuable ways in which clowns can make a difference in people’s lives. On stage and in the ring, in hospitals, and schools, etc., clowns still have great momentum entertaining and helping others. There are even Clowns Without Borders refugee camps all over the world. The breadth of what clowns do has really expanded. And the integration of clowning and acting, dancing, circus, and even burlesque performance is also expanding. Tell me about your book and how it came about. Originally, I started out with two books. One was about the 500 shows I did with Cirque du Soleil, on tour with their tent show Corteo, and the other was a textbook of the curriculum we created at the Clown Conservatory in San Francisco. Neither piece of work interested me much, until I hit on the idea of creating a work of fiction that would weave the two manuscripts together. The book covers a school year, with each chapter focusing on an aspect of clowning, first through the eyes of a student at the Clown Conservatory, and then through his teacher’s eyes, out on the road with Cirque du Soleil. Vulnerability on stage, classic clown routines, improvisation, getting an audience to fall in love with you, building a character, clowning in hospitals, storytelling, and the business of show biz are all explored by a cast of characters including a 7-foot-tall opera singer, a tiny Ukrainian acrobat, a leather-clad Frenchwoman, and a young physicist striving for a career in the Greatest Show on Earth. I’m very excited that The Secret Life of Clowns will be launched nationally at the Smithsonian Folklife Festival’s Circus Arts exposition in Washington, D.C., June 29-July 9. There I will be doing daily readings from the book. My hope is that readers will find day-to-day value in the techniques of clowns. The Smithsonian is launching your book; are you involved in its Folklife Festival 2017? Yes, I’ve been consulting on the Circus Arts exhibition, focused on the clown area. A Bay Area troupe, Circus Bella, will be a featured show, and my organization, the Medical Clown Project, is their partner. For 10 days this summer, some of the best circus artists in the world will be in Washington, and over a million visitors will get to watch and meet them and learn from them as well. I’m really excited that the Bay Area will be very well represented at the festival with at least 20 performers traveling to D.C., including three folks I profile in The Secret Life of Clowns. The contingent is diverse and multi-talented: aerialist/filmmaker, acrobat/medical clown, trapeze artist/producer, ringmaster/nonprofit executive. Artists in our circus community are skilled with their bodies, of course, but also their hearts and minds.